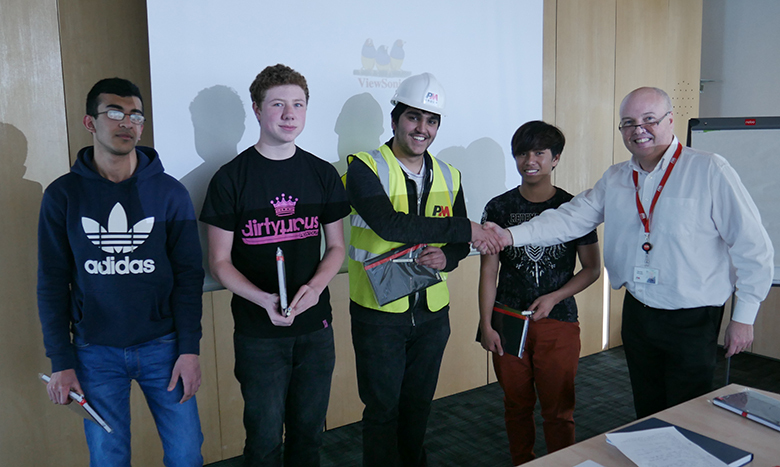 Would-be engineers at The Sixth Form College, Solihull visited PM Group’s Solihull offices this week to undertake a challenge set by the engineering design, architecture, project and construction management firm. Martin Murphy, Project Manager at PM Group, set students in the College’s Engineering Academy a project to design a kiosk. The students were asked to present their ideas for how this kiosk would be used and to explain how they would construct it and what it would cost. The students worked on the project in groups and then presented their ideas at PM Group’s offices near Birmingham International this week. The ideas that students came up with for their kiosks included a place to sell sushi, an educational hub for developing African countries and a virtual reality kiosk. Their presentations showed drawings of their designs, information on the materials they would use to construct the kiosks and an explanation of how the kiosks would be used if they were made. This association with PM Group follows hot on the heels of work that the students have completed with Coventry University. The students participated in a series of practical workshops with the university, which each tackled a slightly different aspect of engineering, but which all had humanitarian applications.